"Lazy eye" can exist even in children with straight eyes and can lead o permanent sight loss if not treated by the critical age that varies from six to eight years of age. The brain and eyes work together to produce vision. Amblyopia is the medical term for poor vision that occurs when the brain ignores one or both eyes. The eye itself looks normal, but it is not being ignored by the brain on varying degrees. 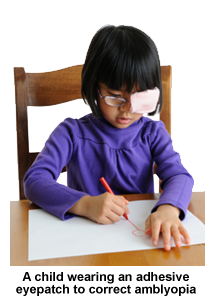 Amblyopia is the most common cause of permanent visual impairment that begin in childhood. If treatment is not initiated before the critical age period has past it can not be corrected with glasses, contact lenses, or surgery. Amblyopia is diagnosed with a routine eye exam. Children are not symptomatic because this is how their vision has always been since birth. Early treatment is usually simple, employing glasses, medicated drops, patching, and occasionally surgery. Eighty percent of everything a child learns is through his or her visual system. 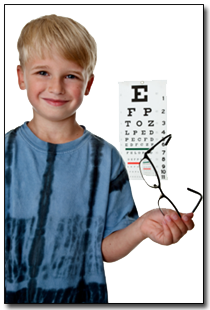 Remember vision screenings at school or by the pediatrician are not comprehensive vision examinations.